Quantum has built a great reputation as one of the UK’s leading flooring solution specialists, providing a consistently high standard of technical excellence for more than 50 years. 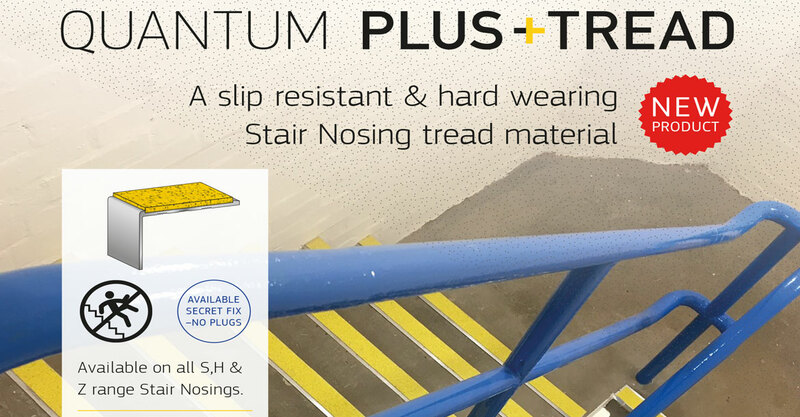 Their stair nosings have been specified in thousands of installations making them one of the nation’s most trusted brands – and now they’re announcing an exciting new product launch which is set to create a new benchmark for pedestrian safety: Quantum Plus-Tread. The result of extensive research, development and independent laboratory testing, new Quantum Protread offers a higher degree of traction than ever before. The PVC tread material utilises mineral aggregate technology to increase surface roughness, but not only on the top layer – the active ingredient is embedded throughout the entire depth of Quantum Plus-tread meaning optimum traction is assured, year in, year out. Plus-Tread’s excellent Pendulum Test Value (PTV) in wet or dry conditions offers substantive proof of its superior performance, providing the surest footing possible for staircase users in one of the highest risk areas that pedestrians will ever encounter in offices, schools, hospitals, retail outlets and leisure centres. What’s more, new Quantum Plus-tread is the only product of its type available to distributors the very next day, and in a choice of six new colours; Carbon, Platinum, Hornet, Sand, Ruby and Aqua – each backed by a 10-Year Guarantee. If you need to specify stair nosings for any industrial, public or commercial situation, new Quantum Plus-Tread is the fastest way to ensure grip integrity is never compromised. Quantum stair nosings have been specified in thousands of installations making them one of the nation’s most trusted brands.